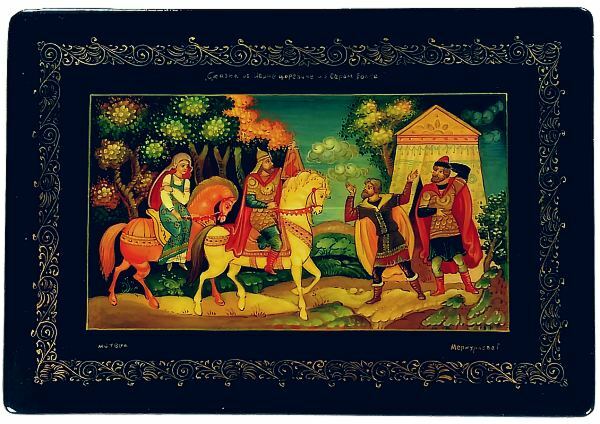 Ivan Tsarevich and Elena are seen approaching two men in their journey. Perhaps the men are giving directions, as the couple has far to travel. Ivan holds in his hand the fabled Firebird, now in a golden cage. Usually one manages to grasp only a feather from the bird (a symbol of happiness) as he tries to catch it, but Ivan was able to seize the entire bird. To read all the entire tale, click here. 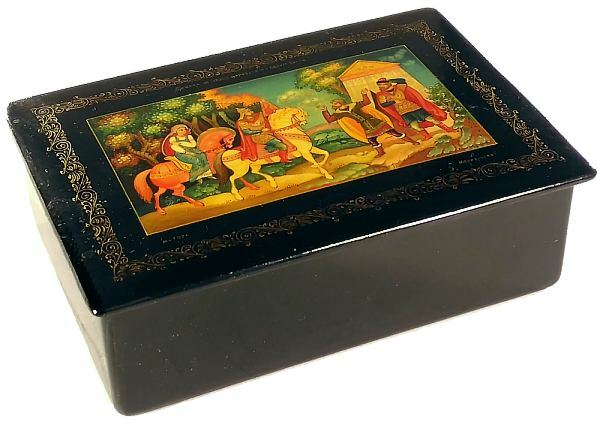 The rectangular box has been carefully painted by Mstera artist Merkureva, and features some nice looking horses and well proportioned people. The colors are quite vivid and uplifting. There is a gold ornament around the drawing, and solid black sides. It sits flat and has a hinge at the top. Signed with the name of the artist, village and title. The box was done probably in the 1980s or 1990s and the lacquer has a slight normal texture to it, with no cracks or chips.